The remains of Castle Haugh sit next to the River Ribble (to the West) and the A682 (to the East) The castle looks out over a crossing of the river, and there is likely another motte defending a ford some way South West on the opposite banks of the river. The castle was most likely established by William de Percy sometime in the 11th century. The remains consist of a motte standing to around 6m high, eroded to the West where it fronts onto the cliff overlooking the river, and partly damaged. The summit of the motte is dished, either through quarrying or as a result of the removal of a small building\tower. The bailey has been lost to the river below it. The motte is surrounded by a well preserved ditch which is around 2m deep in some places. 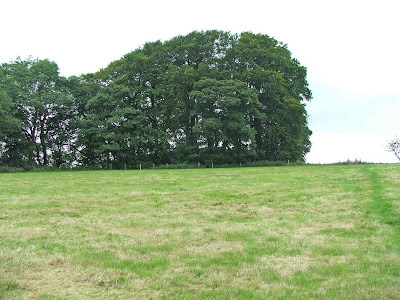 The site is easily accessable via a footpath that passes right next to the foot of the motte. Be aware though, that there is no parking near the site. The A682 at this point is is very narrow and busy. About two miles West of Spark Bridge on the A5092 lays the tiny village of Lowick. 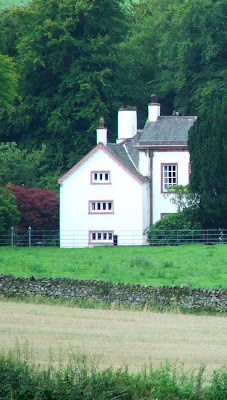 The manor in and around Lowick has existed since the end of the 12th century, and was originally owned by William de Lancaster, 5th baron of Kendal. William granted the lands to Robert de Turribus sometime during the reign of Henry II. The manor then passed from Gilbert de Turribus, son of Robert, to William de Lofwic. In time the manor passed, by marriage, to the Ambrose family, in whose ownership it remained until 1684. It's likely that the pele tower was built during this period, possibly a little earlier. It seems that the last Ambrose, John, died with no male heir, so the manor then passed to John Latus, his nephew. John Latus married a member of the Hudleston family....of Millom Castle, by whom he had a son, Ferdinando Latus. 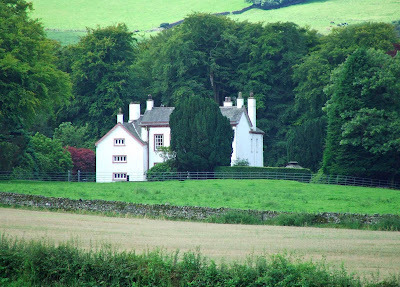 The manor then passed into the Blencowe family by marriage. The tower portion of the hall, isn't as old as the manor, but probably dates from the 15th or 16th century. The building has undergone many rebuilds and extensions. Looking at the photo, the remains of the pele tower are on the left of the building, with the layout resembling other converted pele towers in the county, namely Godmond Hall, Selside Hall and Preston Patrick Hall to name but a few. Documents suggest that there were two pele towers at this site, possibly one predating the surviving tower, as all that remains of the second are reputed footings. Unfortunately, as this is a private dwelling I was unable to pay closer inspection. The best views of the hall can be had from the nearby church yard, although even then, trees between the hall and the church yard can block the view. 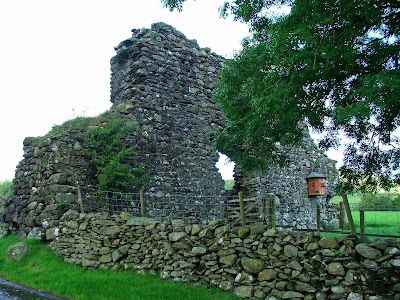 The remains of Ulpha Old Hall lay to the North of the Duddon valley, and the to the West of Coniston. This is a beautiful part of West Cumbria. The remains consist of the east facing wall with the open remains of the main doorway, upstanding walls to the north, south and east (although only to about ground floor height) and several pieces of disconnected wall. The surviving portions of wall are are around 1.2m thick, but the wall with two surviving fire places is about 1.6m thick, no doubt in order to provide additional protection in the weakened part of the building. 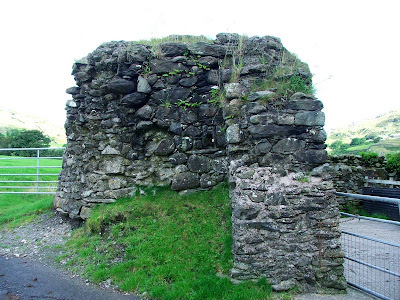 It's believed that the tower was built sometime between 1580 and 1620, rather late for a pele tower, perhaps indicating a purely secure building rather than a defensive building. In three portions of the walls, there are small looped windows...small enough to see out of, and perhaps fire a weapon, but too small to gain entry. Documentation on the internet seems to suggest that the ruins were\are due for demolition. Thankfully this hasn't happened and hopefully the remains will survive even longer. The highest surviving portion of the building can be seen below. The thickness of the walls is clearly visible here. The photo above shows a portion of the corner of the tower, with a small gun loop visible. The remains sit in a field at the side of the road, affording excellent views. 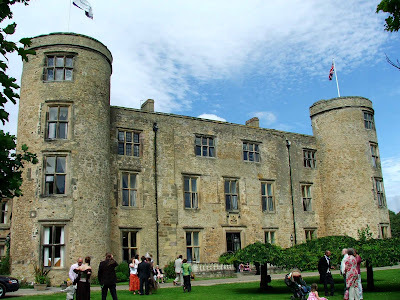 Situated about 7 miles North West of Darlington, Walworth castle dominates the deserted medieval village of Walworth a few hundred yards away to the North. The whole landscape around the castle is testament to the strength of the manor that once held feudal sway over this area. The castle as we see it today essentially dates from the early 1600’s, although the structure is said to contain masonry from a much older building. Documents from 1466 describe the manor as “one chief messuage with divers outhouses”, so basically a main house with a collection of outhouses nearby. The castle started as a U shaped building, with a rear wing, and the two towers standing guard over the entrance into the courtyard. Whether the open end of the courtyard was protected by a wall or a wooden palisade is unknown, but it’s likely that there was some sort of adjoining structure between the towers. The manor was built on the ruins of a much earlier castle, possibly dating from the 1150’s, when the Hansard family built the nearby village of Walworth and the original castle. The estate contained lands to the tune of around 1100 acres. The nearby village was probably abandoned in the mid 1300’s, possibly due to the plague. The remains of the village can still be seen as earthworks in nearby fields. Arial photos clearly show the remains of buildings and track ways. As a result of the plague, and the affects that it undoubtedly had on the nearby villages, the estate including the castle fell into disrepair. In 1367, Ralph Neville, later to become 1st Earl of Westmorland, was granted ownership of the manor of Walworth. Neville held sway over vast areas of the North East, including the areas surrounding Raby Castle and large parts of Richmondshire. By 1391, the castle and the manor were back in the hands of the Hansard family, when Robert Hansard claimed the estates on behalf of his son, Richard. The fortunes of the castle seem to have improved from here, and the estates stayed in the Hansard family until 1539. It was then, that the Hansard estates were transferred by marriage to the Ayscough family, when Elisabeth Hansard married Sir Francis Ayscough. Their only child, William inherited the estates on the death of his parents, eventually marrying the Earl of Lincoln’s daughter in around 1563. Childless, and therefore with no heir, the couple sold the castle and the estates to Thomas Jennison in 1579. The castle and the associated estates remained in the Jennison family for some time. In 1603, the castle received a royal visitor, in the form of King James 1st. As the king was travelling to London to his coronation to become the first monarch to reign over both Scotland and England, he was entertained at the castle on the 14th of May. The king was so impressed with the lavish entertainment that was bestowed upon him at the castle, that he knighted Elizabeth’s son in law, George Freville. When Elizabeth Jennison died, in 1605, the castle and the estates were valued at £954 10 1d. 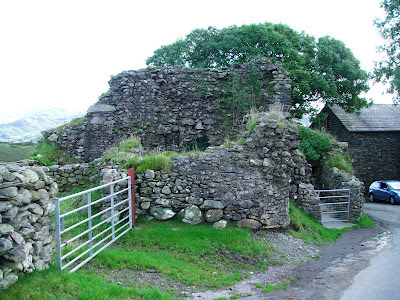 Between 1634 and 1681, the castle was a hotbed of Catholic rebellion, and fell into ruin as a result of the activities of the family against the Protestant faith and the crown. The castle was sold in 1754, when the Jennison family finances were found to be almost bankrupt due to the amount of money spent on the lavish decoration inside the castle. Matthew Stephenson, a wealthy wine merchant from Newcastle bought the castle for £16000. The castle was then sold once more in 1775, to John Harrison another wealthy merchant from Newcastle. In 1819, John Harrison died, leaving the castle to his only daughter, Ann. She married General Arthur Aylmer in 1825. During his ownership, the castle was renovated and re-decorated, with much of the dilapidation resulting from years of neglect, being repaired and the structure of the castle being made good. The Aylmer family died out in 1931, resulting in the castle being purchased by brothers Neville and Charles Eade. 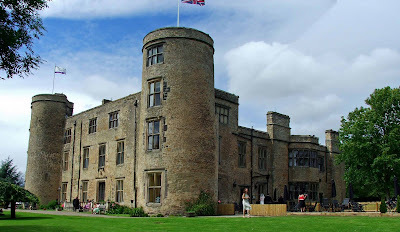 During the 2nd World War, the castle was rented out to the Durham Light Infantry, who used it as a prisoner of war camp for high ranking German and Italian prisoners. 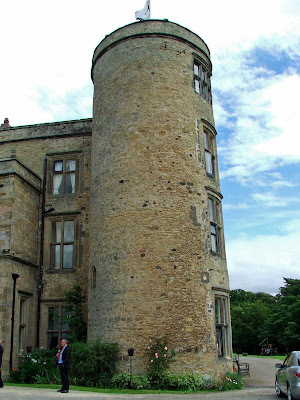 In 1950, the castle was purchased by Durham County Council who subsequently turned it into a girl’s school. The building is today used as a hotel, hosting receptions, weddings and conferences. There is little information regarding the original structure, except in the context of a collection of possibly fortified buildings providing protection to the nearby village. The village and the castle were on a route used by various invading Scottish armies, so protection was necessary for the population, probably on a regular basis. The oldest part of the current structure is the South West tower, the left hand tower in all the photos here. Some bricked up looped windows can still be seen in this tower, indicating that it was built as a defensive building. The courtyard, now enclosed in a glass sun room, has spectacular pillared walls with original, possibly medieval windows still in situ. 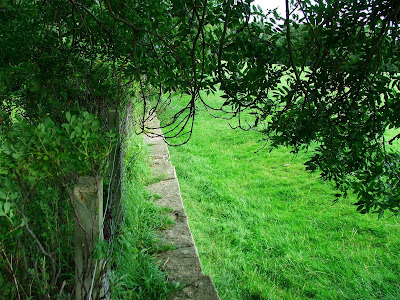 To the South of the castle, the 18th\19th century haha wall is still intact, preventing cattle from entering the grounds of the castle, whilst preserving the view out across the fields.